13th May 2017 – Olympic silver medallist Hellen Obiri (KEN) produced a stunning performance at the IAAF Diamond League in Shanghai. 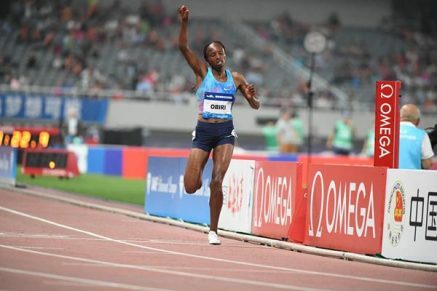 Running in the 5000m Hellen found herself at the head of the field once the pacemaker stepped aside 2000m into the race and maintained the fast rhythm that had been set continuing to clock kilometre splits in the low 2:50’s. Over the final kilometre, she broke clear from those that had managed to hang with thus far and continued to pour on the pace finishing with a 64 second last lap that saw her cross the line in 14:22.47. A significant performance that was a new personal best, the 2017 World Leading time, second fastest time ever by a Kenyan and PACE athlete (only behind Olympic Champion Vivian Cheruiyot (KEN)) and number 6 on the all-time list. Even more impressively this run came just 4 days after she had defended her 5000m title at the Kenyan Defence Forces Championships in Nairobi. Also at these championships Winny Chebet (KEN) took second places in both the 800m and 1500m. Olympic 400m hurdles finalist Ristananna Tracey (JAM) ran over the flat 400 in Jamaica and took third place in a seasons best 52.29 seconds.